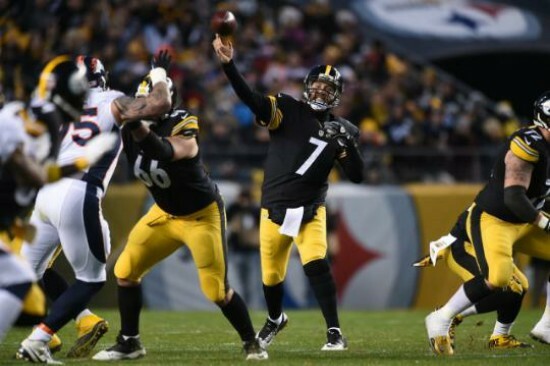 Steelers Overcome First Half Deficit in 34-27 Win Over Broncos | "IT'S A STEELERS WORLD"! “Whew”! Are you as absolutely exhausted as I am? If you aren’t, then we must have been watching two entirely separate games. The Pittsburgh Steelers (9-5) dug themselves out of an unforeseeable hole, coming back from a 14 point deficit at halftime to defeat the Denver Broncos (10-4) at Heinz Field this afternoon. In doing so securing themselves in the final wildcard playoff spot for the time being, because they need to continue to win to hold on to it. What began with a Steelers punt to cap off the first drive of the game turned into a Broncos fumble by running back Ronnie Hillman at the end of a 9 yard gain, which was recovered by Pittsburgh safety, Mike Mitchell. A DeAngelo Williams touchdown on the ensuing drive put the home team up 0-7, and was believed to be the tempo setting score of the matchup. Or so it may have seemed. On Denver’s next possession unproven quarterback, Brock Osweiler hit wide receiver, Demaryius Thomas for an 18-yard score then found receiver Emmanuel Sanders for an easy 61-yard catch and run. Osweiler then stumbled his 6-foot-7 frame across the goal line to make it 20-7 and when Thomas stiff armed Pittsburgh’s weakest link, Antwon Blake to finish off a 6-yard touchdown, putting the Broncos up 27-10 before a Steelers field goal by kicker Chris Boswell made it 27-13 at the half. The second half was 100% the Pittsburgh Steelers half, and the defense proved that by coming out making two consecutive stops topped off by two Ben Roethlisberger touchdowns to wide receivers, Antonio Brown and Markus Wheaton which tied the game at 27 all with 12:34 left in the final quarter. Another defensive stop due to an interception by linebacker Ryan Shazier, ended in another “touchbrown” by Antonio, giving Pittsburgh it’s first lead since Williams’ 2 yard touchdown early in the first quarter with the score of 27-34 with 3:24 left in the game. It all came tumbling down on the next Pittsburgh possession when Roethlisberger threw an interception with just over 2 minutes left , giving the Broncos an opportunity to produce a tying touchdown from the Steelers 41 yard line. But that would not be. Pittsburgh corner, William Gay made the 4th and 10 stop with a pass deflection solidifying the Steelers victory over the visiting Broncos, while putting a 21-0 second half in the books.